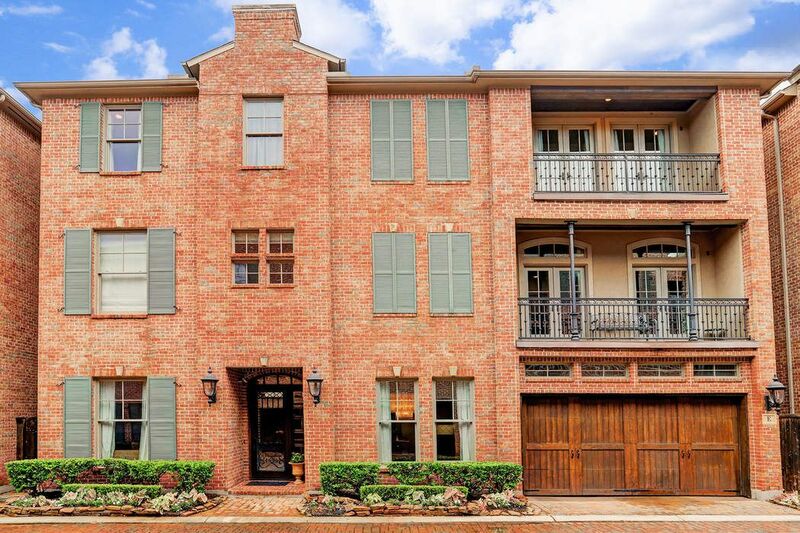 1010 Nantucket Drive Unit E, Houston, TX 77057 | Martha Turner Sotheby's International Realty, Inc. 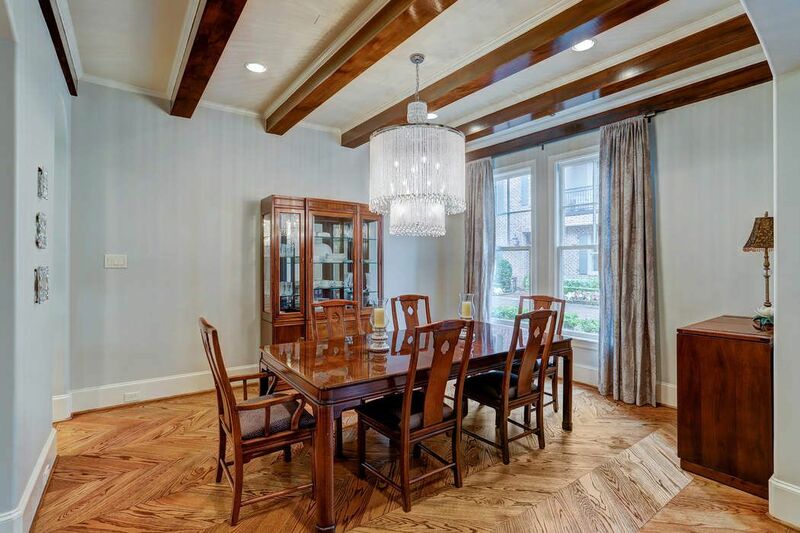 Dining room features wood beam accented ceiling, hardwood floors in decretive herringbone pattern, designer lighting and custom draperies. 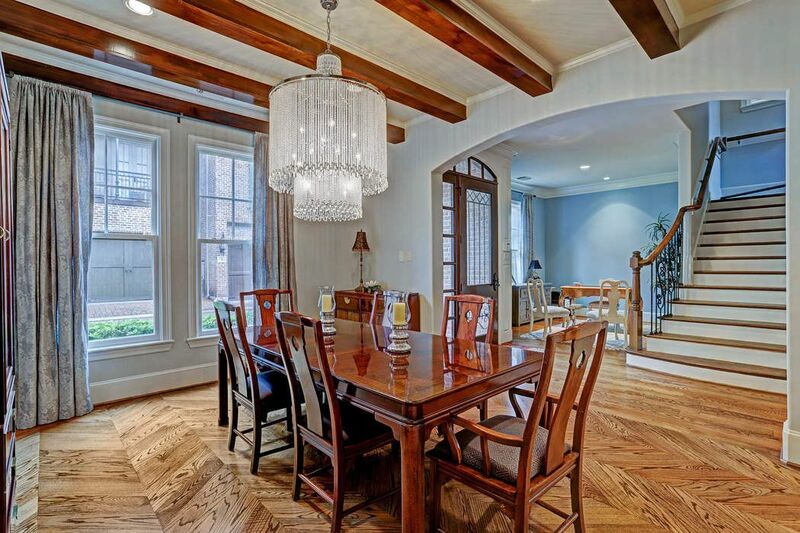 Another view of this lovely dining space. 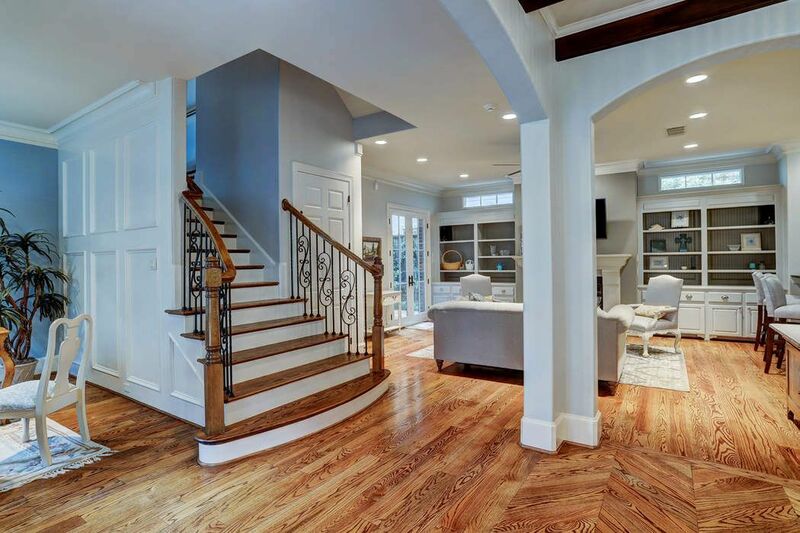 Notice the gorgeous wood floors laid in a herringbone pattern. 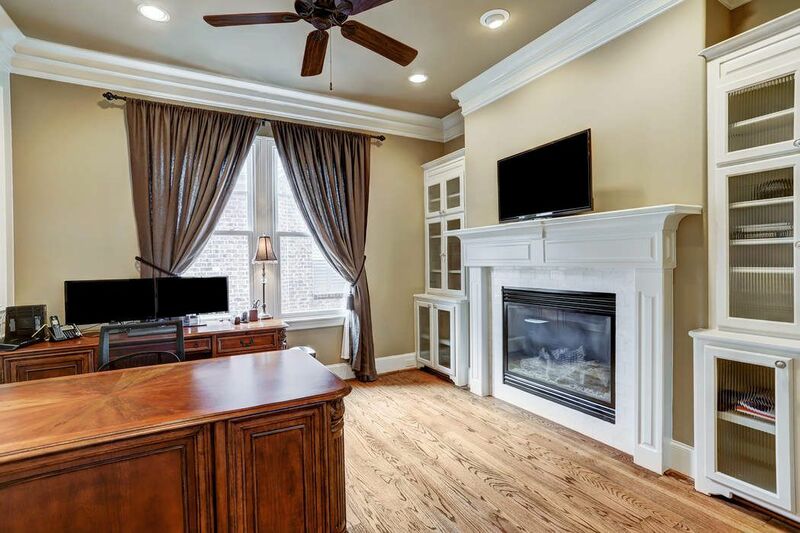 Light filled formal living or study with wood floors, custom millwork and secret panel in the wall. 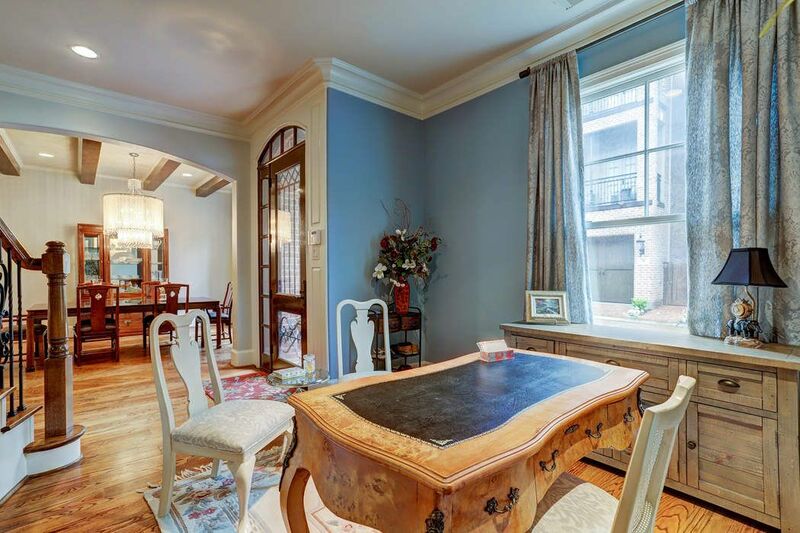 Study is open to the entry and overlooks the dining room. 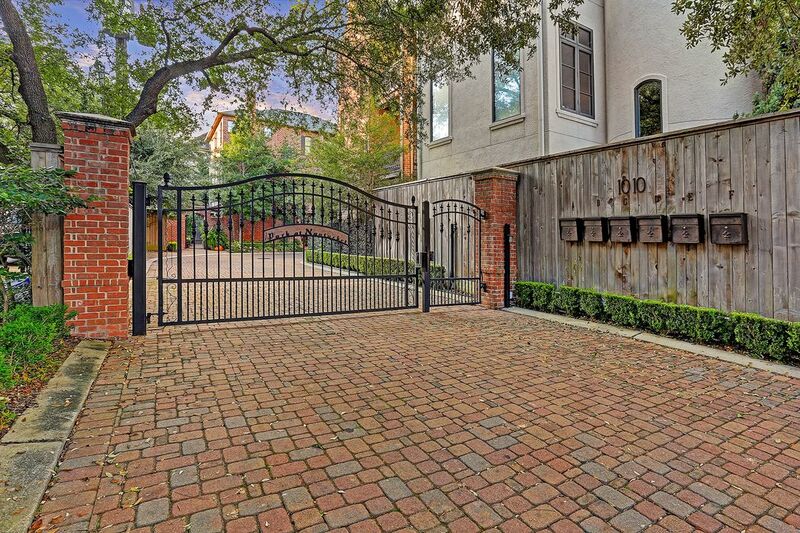 Open and inviting entry welcomes you to this amazing home. 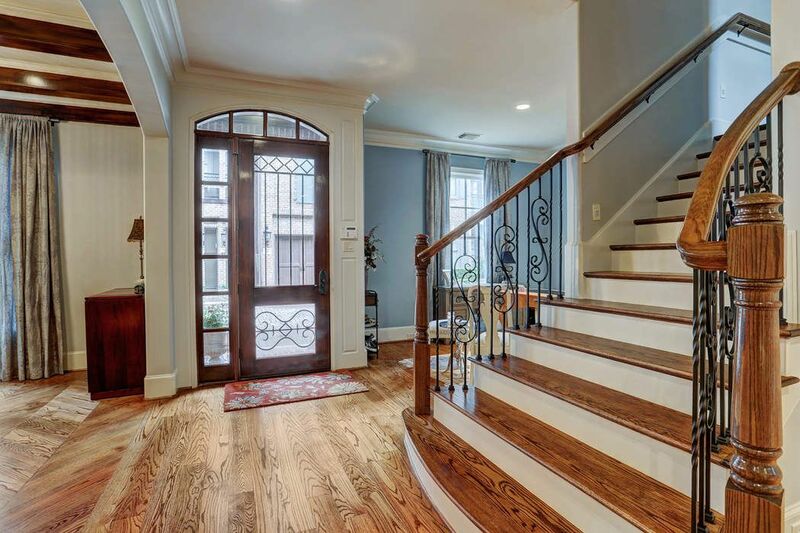 Arched entry highlighted by inset glass wood door and extensive moldings make this entry so inviting. 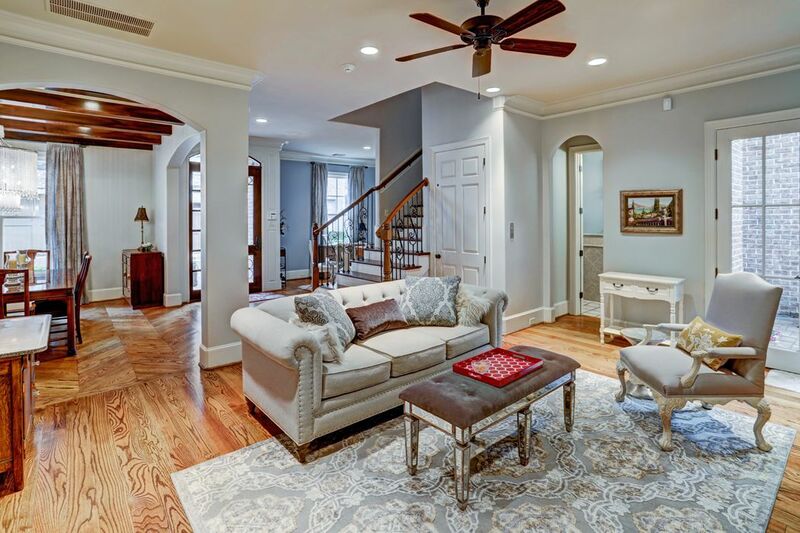 Architectural detail abounds throughout this wonderfully designed first floor. 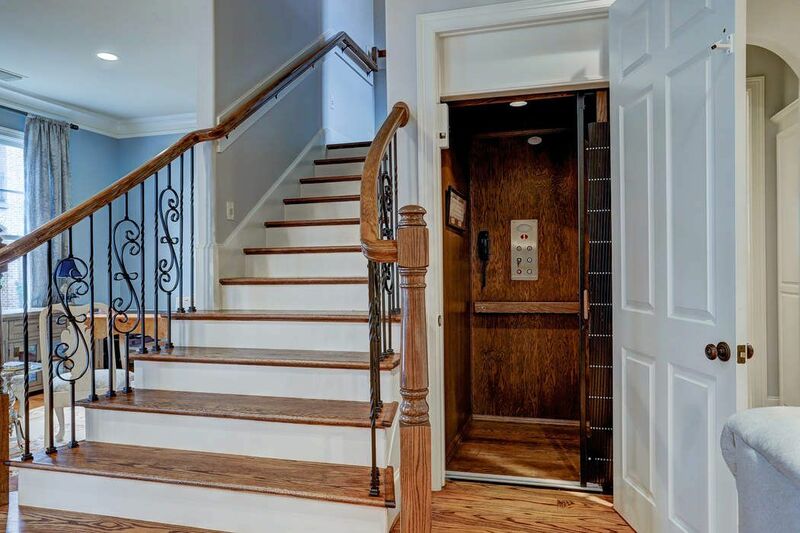 Wood paneled elevator offers easy access to all three floors. 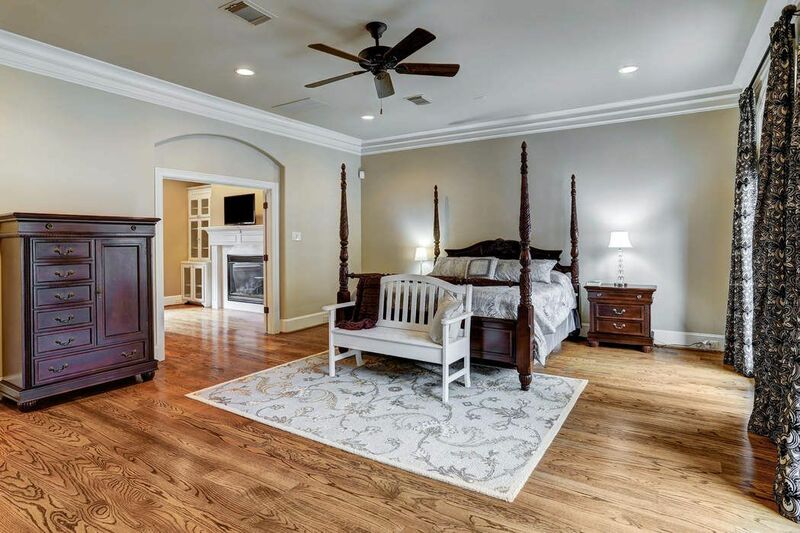 This lovely den features hardwood floors, cast stone fireplace flanked by custom built-in's, the French doors open to the courtyard. 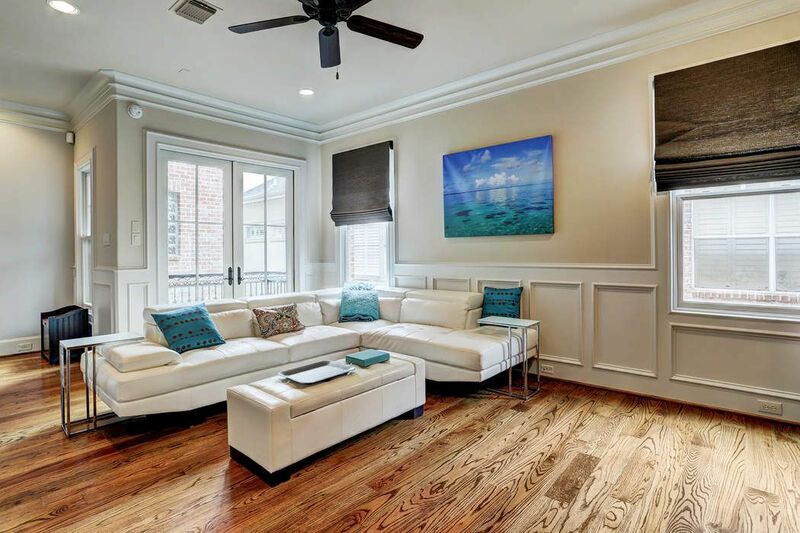 View of the den which is open to the front of the home. View of the den open to the kitchen. View of the den and kitchen. 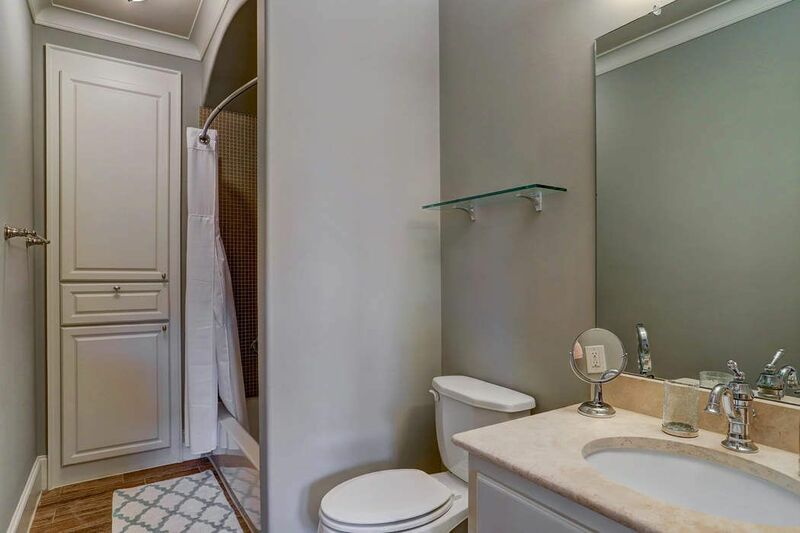 First floor powder bath with exquisite attention to detail, stone and marble finishes make this space special. 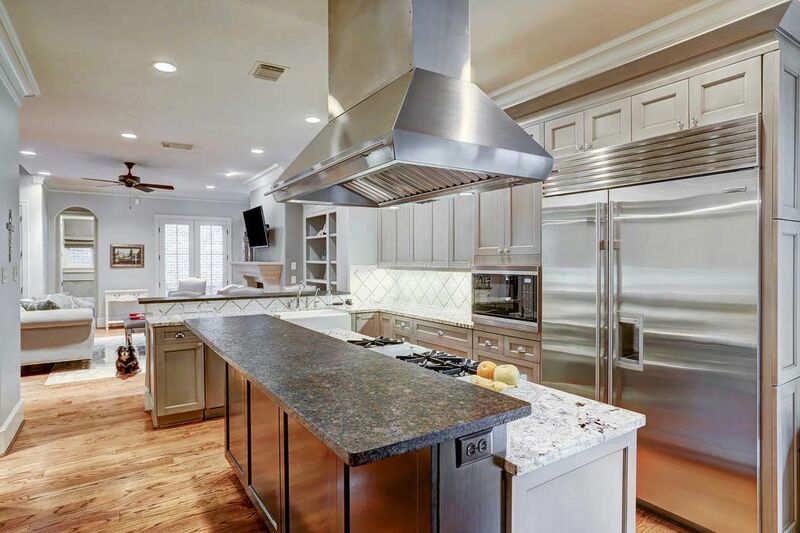 Ohh, la,la...oversized Sub Zero fridge, Wolf gas range, granite counters and breakfast bar. 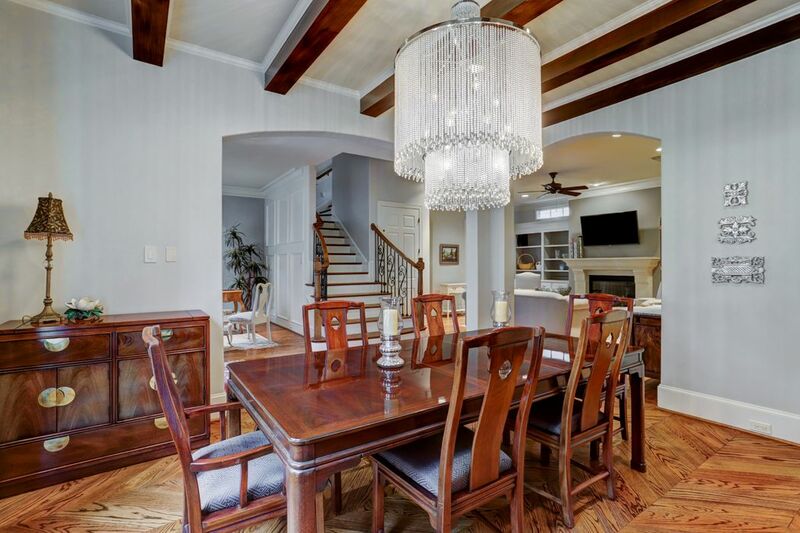 Additional dining bar adds ample seating and make entertaining a breeze. 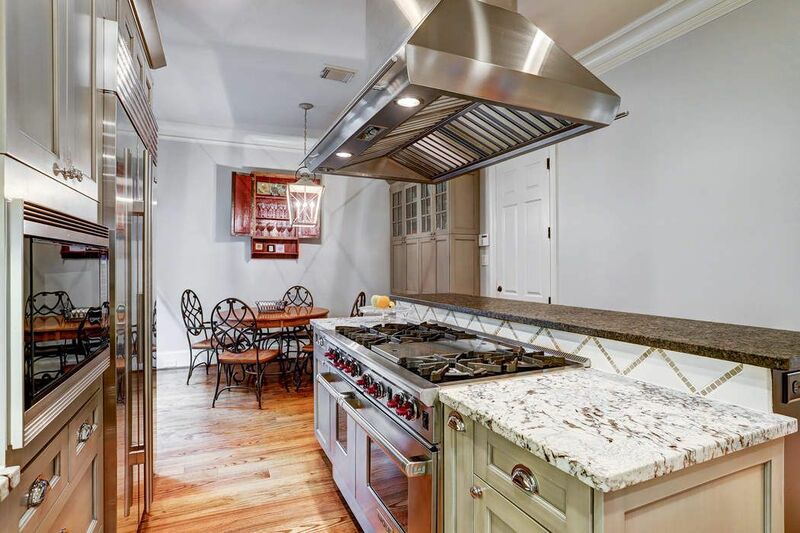 This kitchen is a chef's dream with it's Wolf 6 gas burner with grill and double ovens, and industrial vent hood. 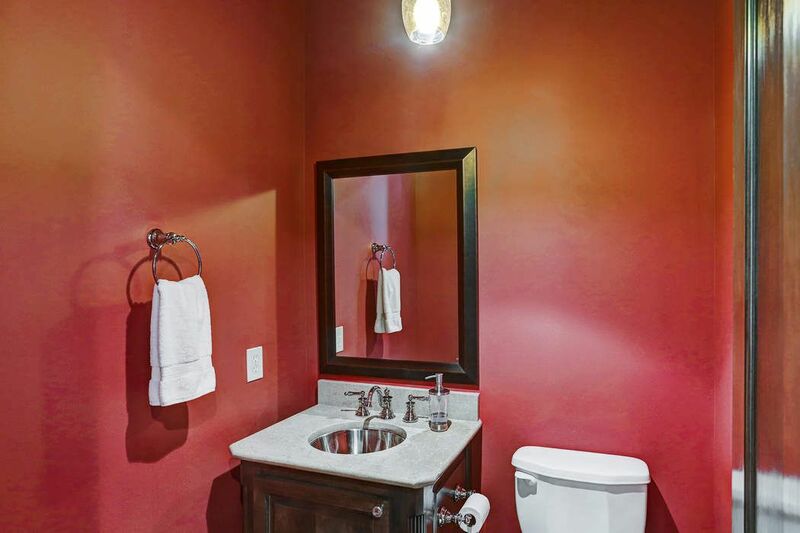 Chrome fixtures compliment the under-mounted farm house sink. 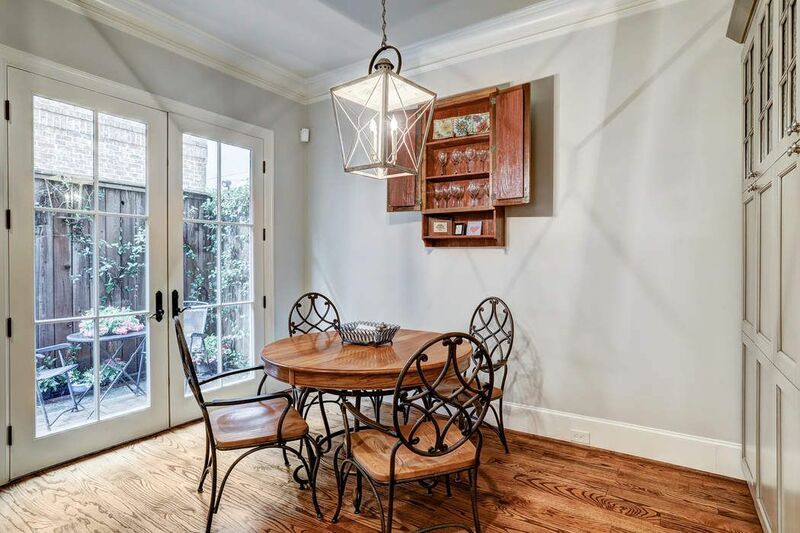 Charming breakfast area with french doors which open to the back patio. 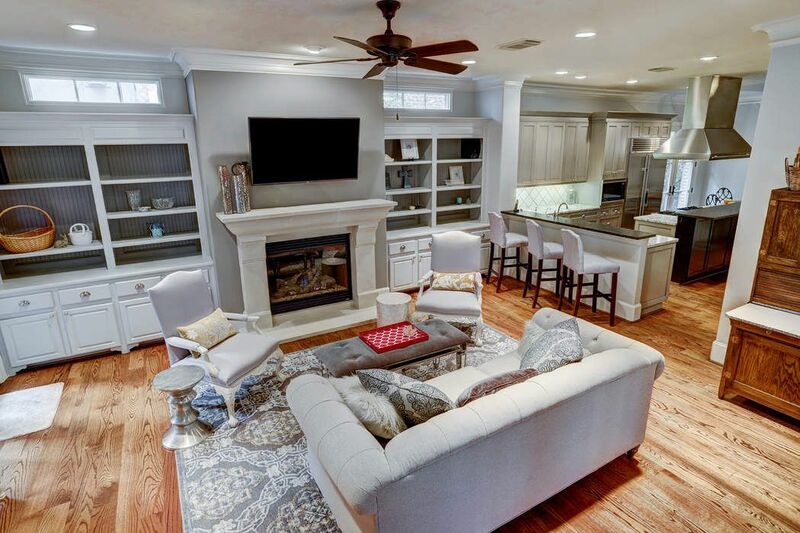 Plenty of extra storage with floor to ceiling custom cabinets. 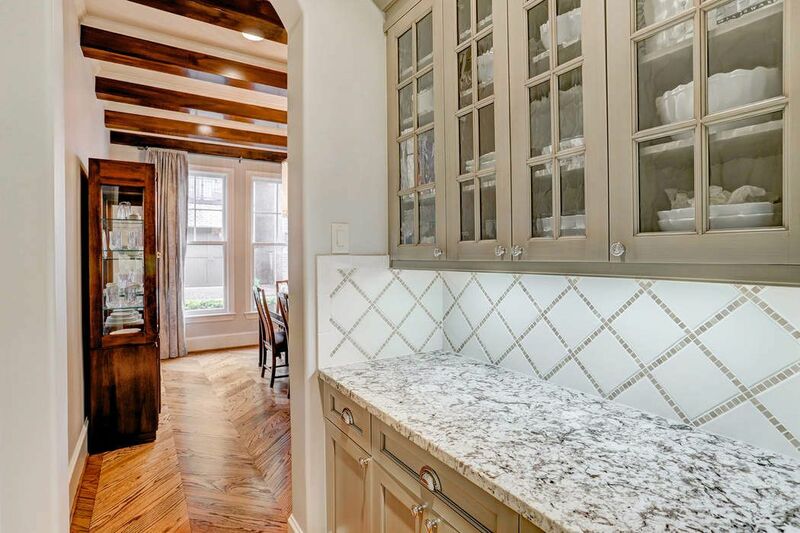 Butler's pantry is conveniently located between the kitchen and dining room and provides amble storage and an additional serving area. 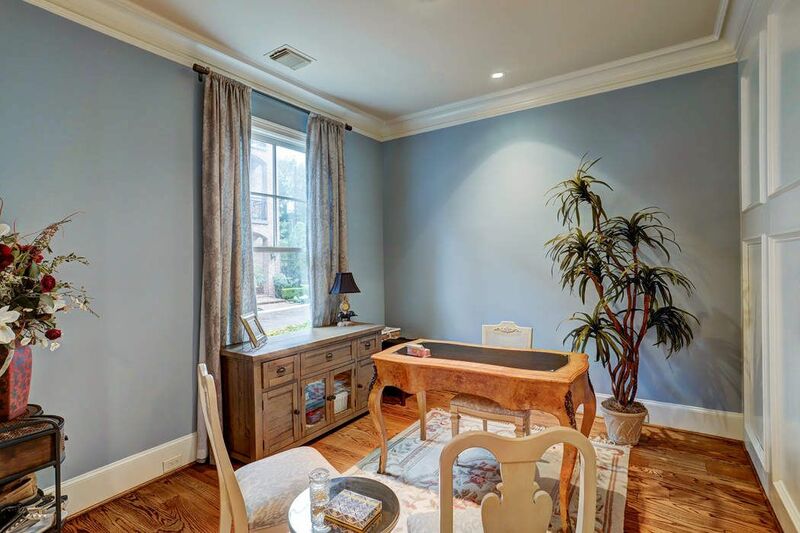 Second floor game room with wood floors, crown molding and french doors leading to the balcony is the perfect place to unwind. 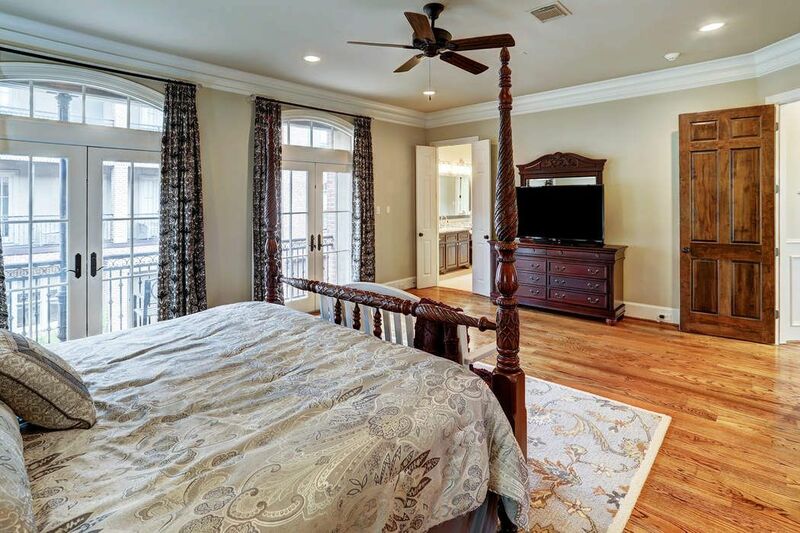 Luxurious master suite complete with wood floors, custom moldings and drapery is adjacent to your own private study or sitting area. 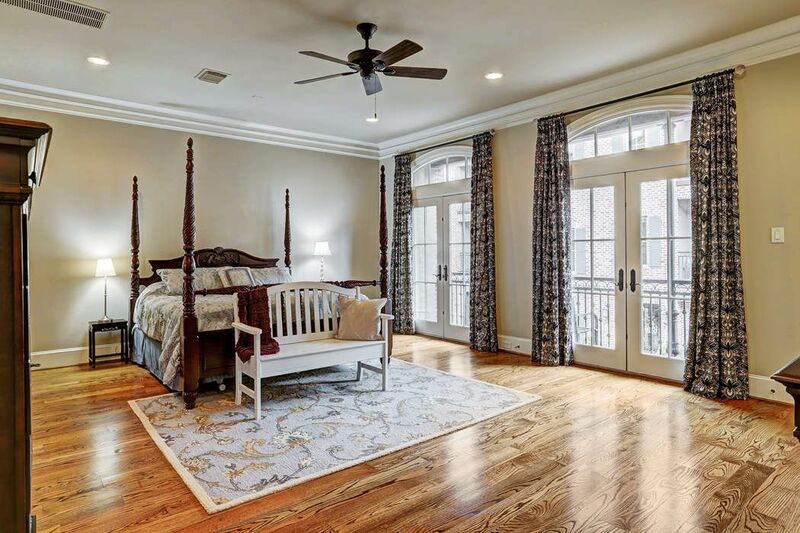 Another view of the spacious master bedroom located on the second floor with french doors leading to the balconies that overlook the courtyard. 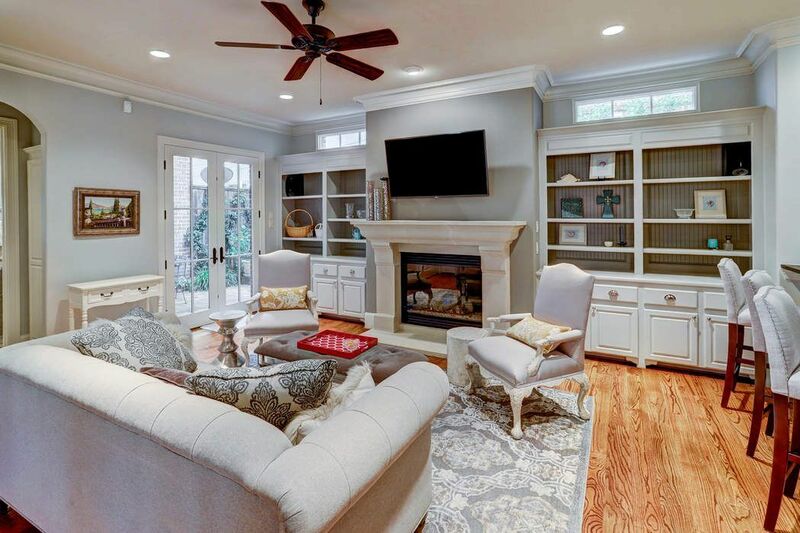 Sitting room just off Master stays cozy with fireplace, glass-front built-in shelving, and directional lighting. 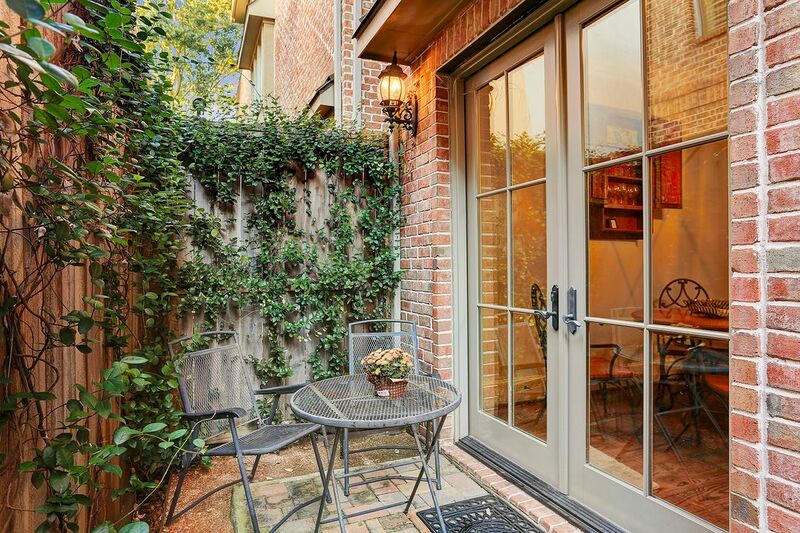 French doors close for privacy. 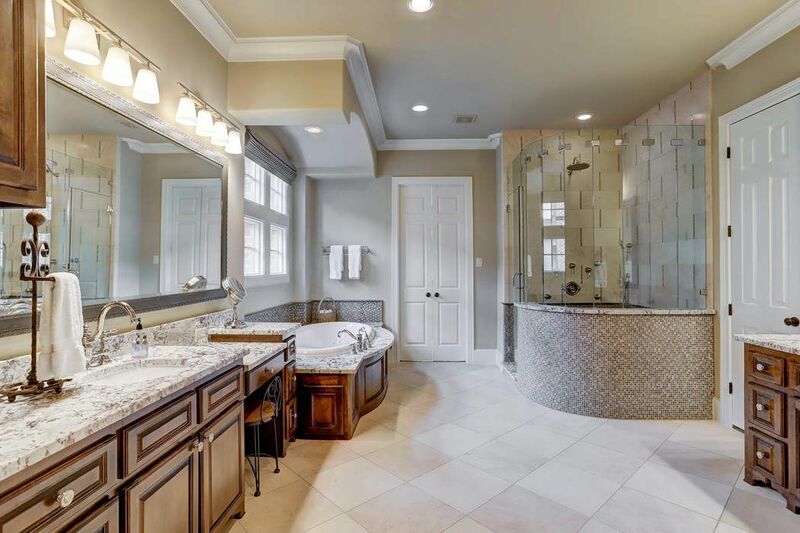 Arched drop-ceiling above the spa tub creates its own space for relaxing, with counter-ledge for placing a book, beverage, or surrounding yourself with candlelight. 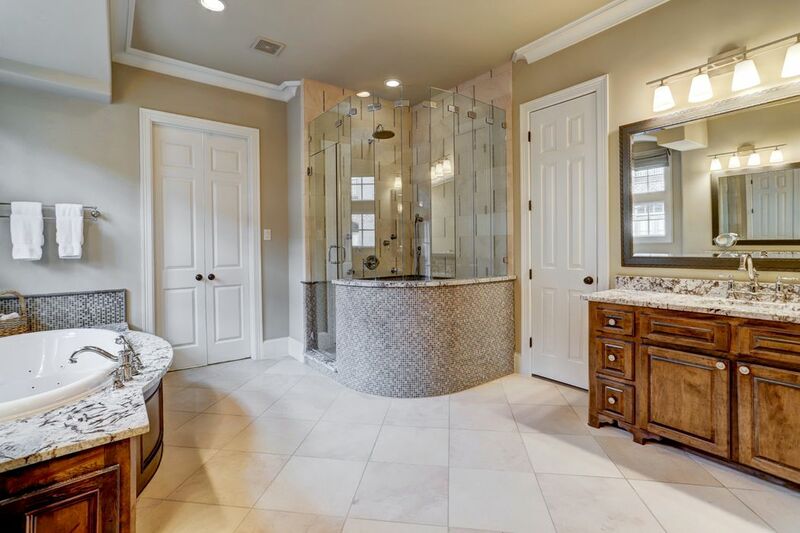 Master bath includes this custom shower with rounded mosaic tiled base and custom glass enclosure. 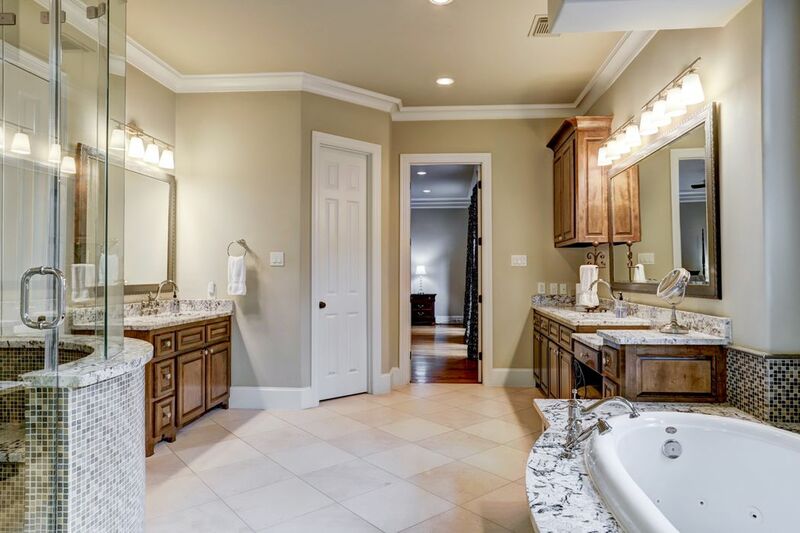 Spacious master bath boasts custom tile and marble throughout, a spa tub, dual sinks and vanity areas. 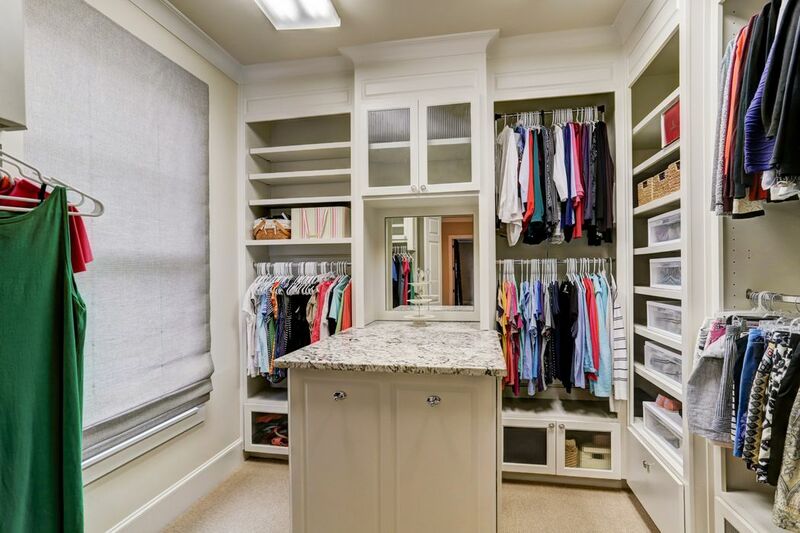 The master closet, structured with all your needs in mind, includes a window to shed light on your wardrobe choices, handy dressing island with extra storage. 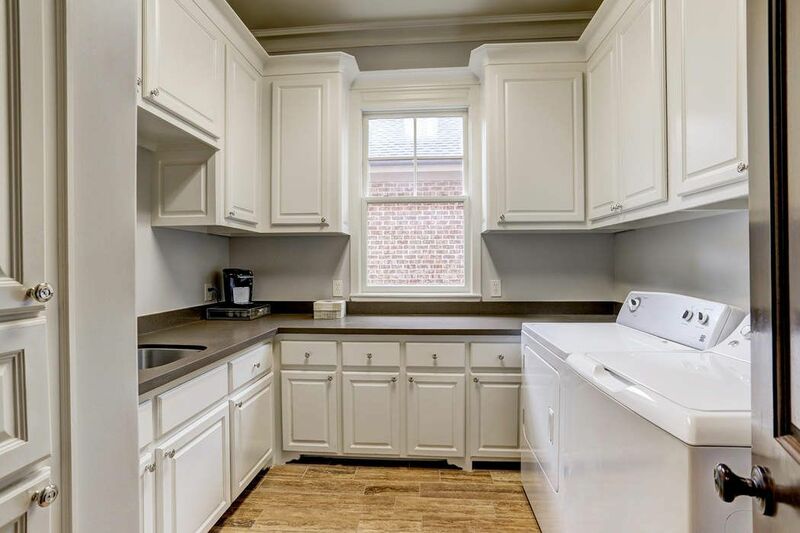 Thoughtfully designed full-service utility room with extensive storage, plenty of counter space, and handy sink is perfectly placed on the second floor and doubles as a coffee bar. 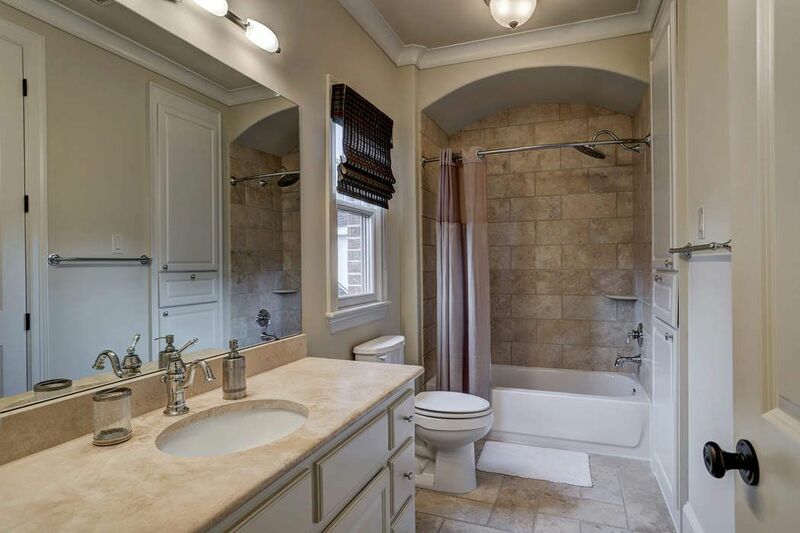 Half-bath conveniently located off of the gathering room on the third floor. 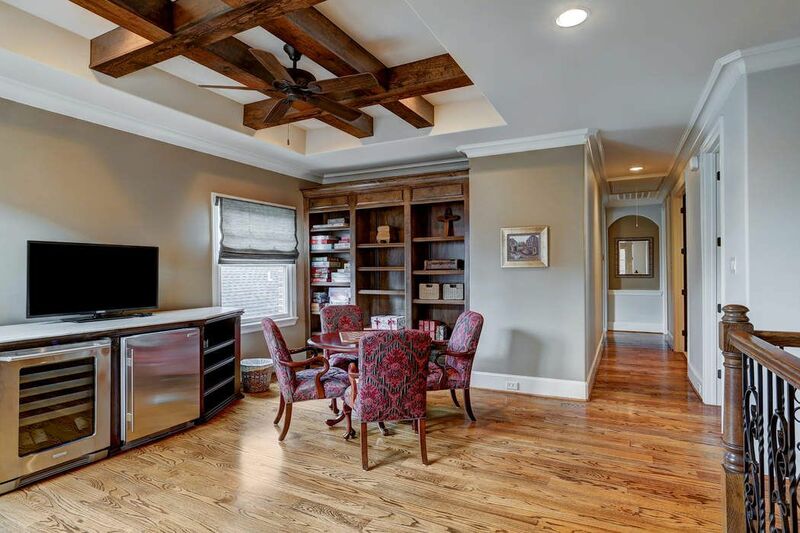 View of the third floor gathering area with built-in bookcase. 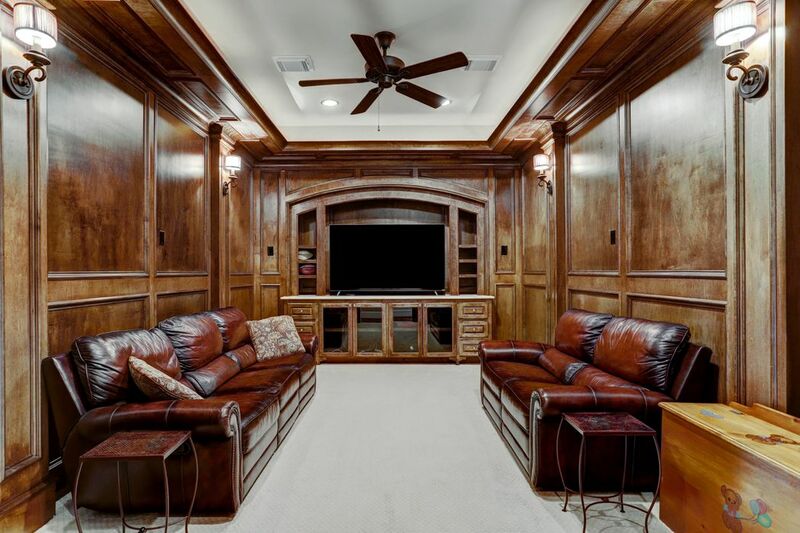 Enjoy your favorite movies in the comfort of you own media room with exquisite custom wood built in's, paneling and moldings. 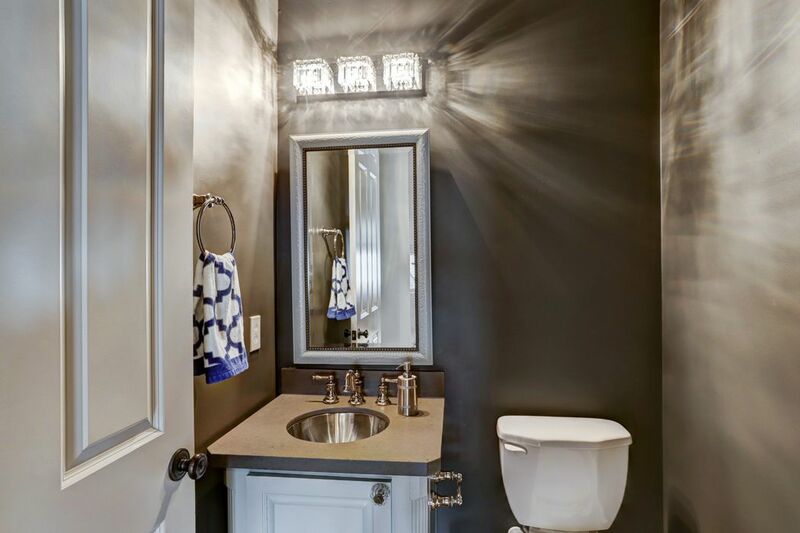 The sconce lighting plays off the warm grays in this immaculate half bath located off the card room on the third floor. 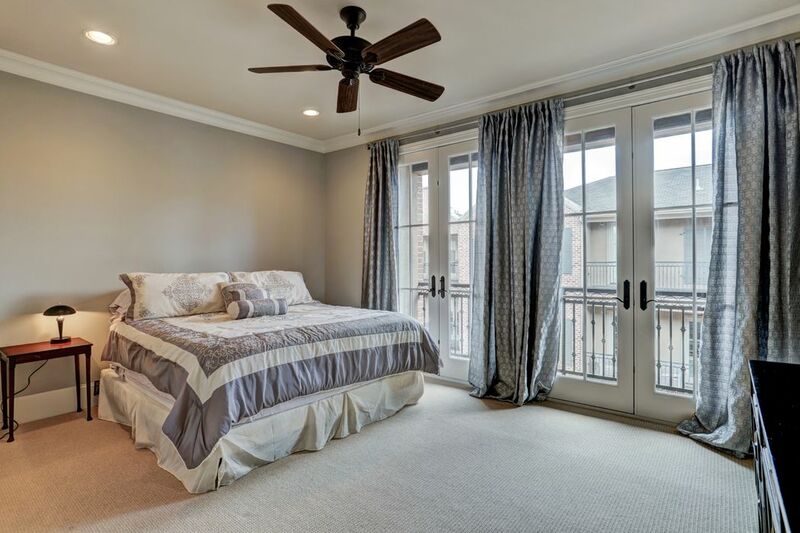 Crisp light filters through the double french style doors which open for an inside/outside feel without having to leave the comfort of your bedroom. 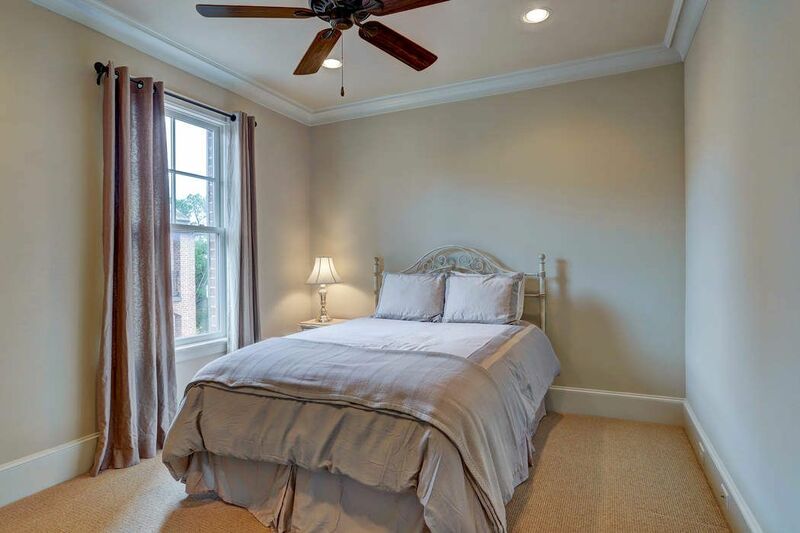 One of the three secondary bedrooms on the third floor with neutral tones and well-placed window. 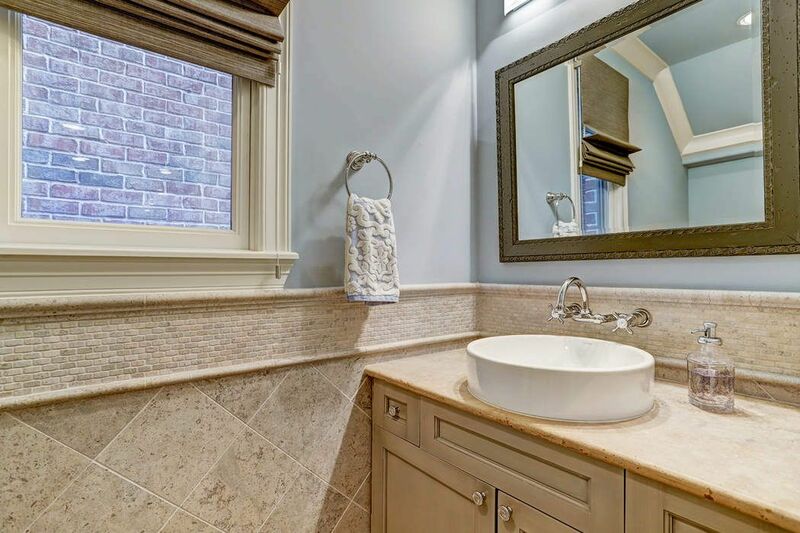 Another ensuite bathroom featuring natural light and natural stone counters and floors. 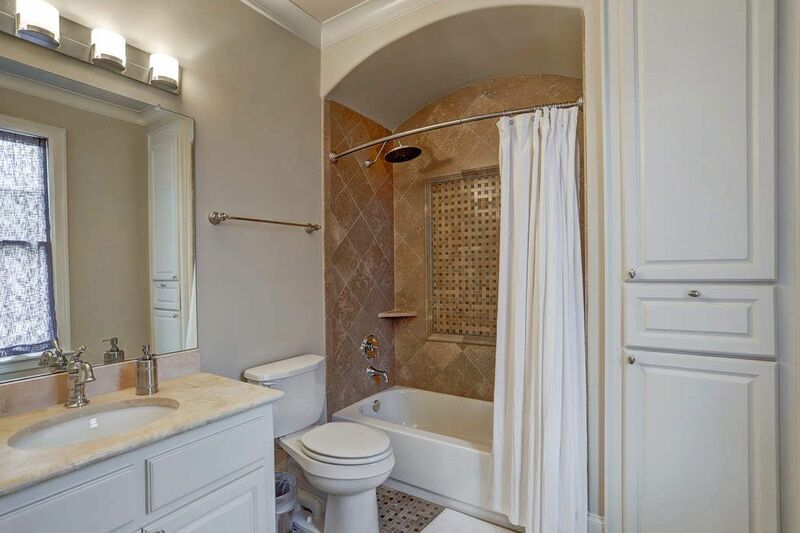 Secondary ensuite bathroom has beautifully tiled floors, decorative Travertine inlay in arched shower. 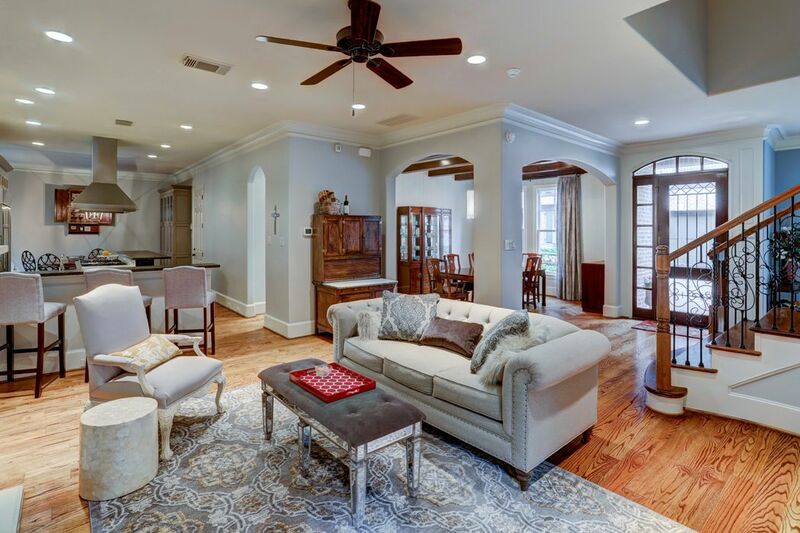 Traditional elegance with European flair located in this exclusive gated patio home community around the corner from Houston Country Club. The enclave is so quaint. It simply glows at night. Several places to relax outside. This is the side patio just through the French doors off the den. Behind this viewpoint is entry gate to the enclave. Looking at the side patio out towards the enclave. Plenty of room to store your grill. 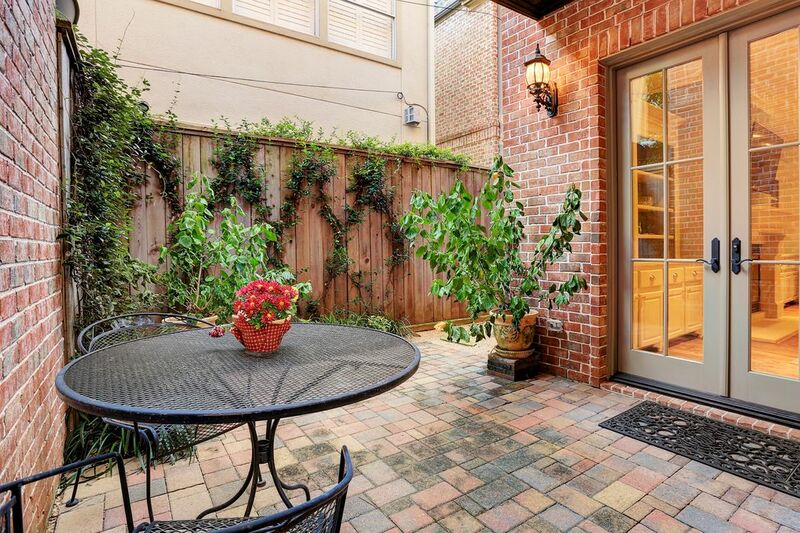 This is the back patio just through the French doors off the breakfast area. Another great place to enjoy the low-maintenance outdoors. 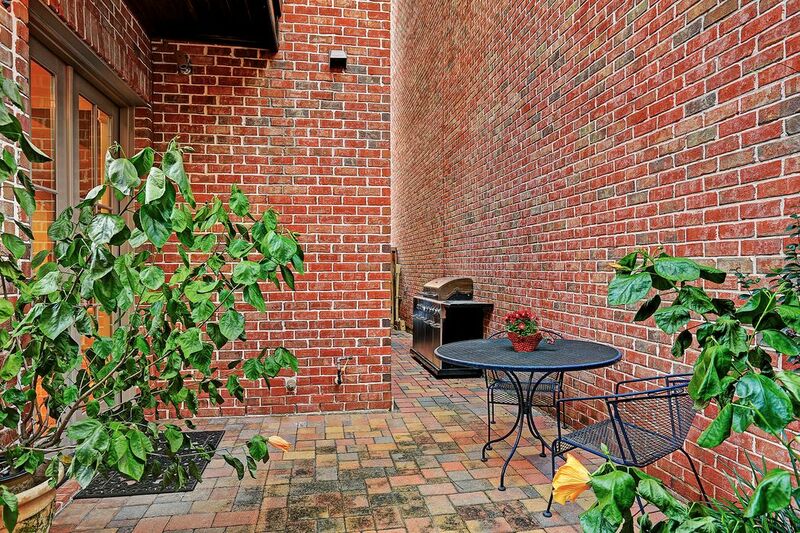 The path leads to the other patio. Another view of this cute corner on the back of the house. 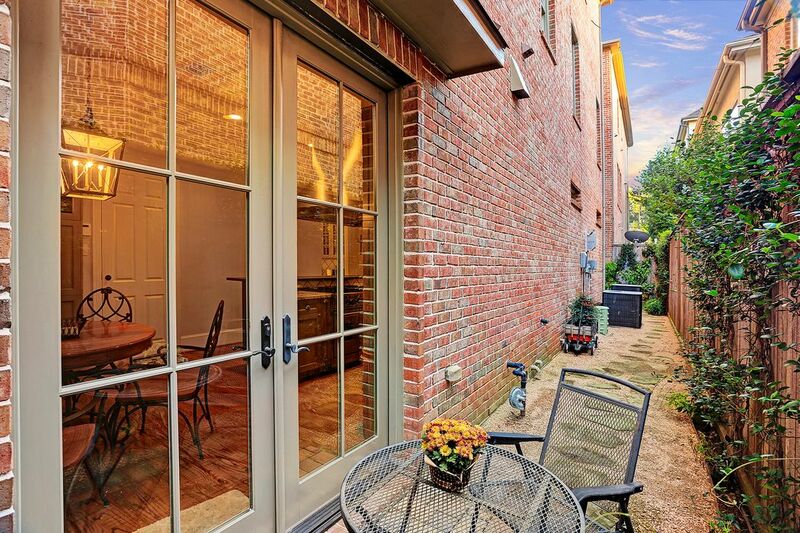 Open the doors to extend your breakfast experience outside. A view of the enclave from the other direction. Seen here, first house on left. 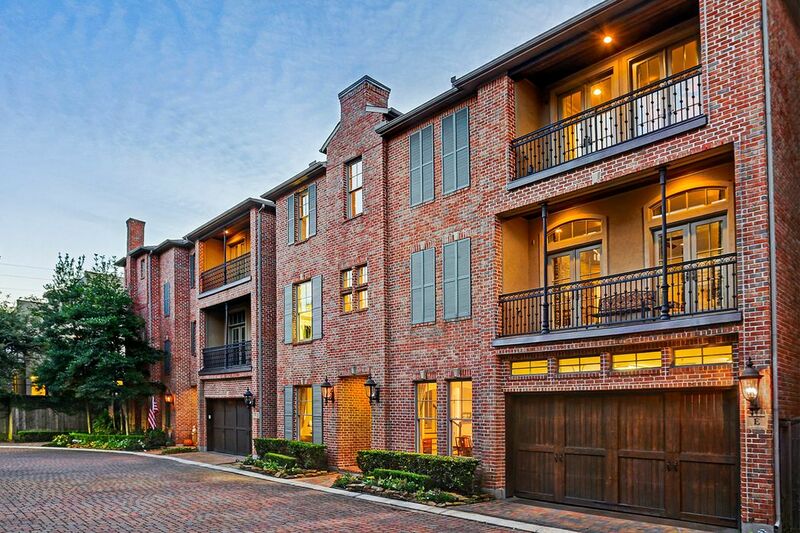 HOA keeps area well maintained. Enclave entry with drive-in and pedestrian gates. The entire enclave is bricked like this! 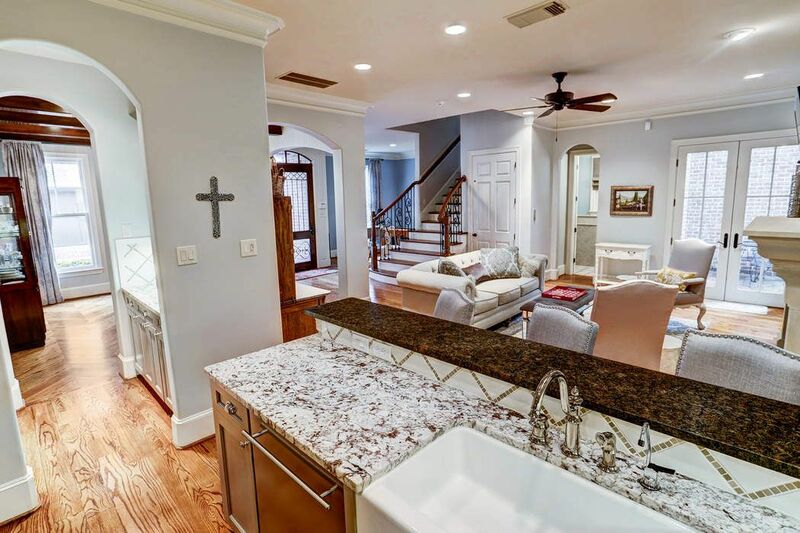 $1,125,000 4 Bedrooms4 Full / 3 Partial Baths4,718 sq. 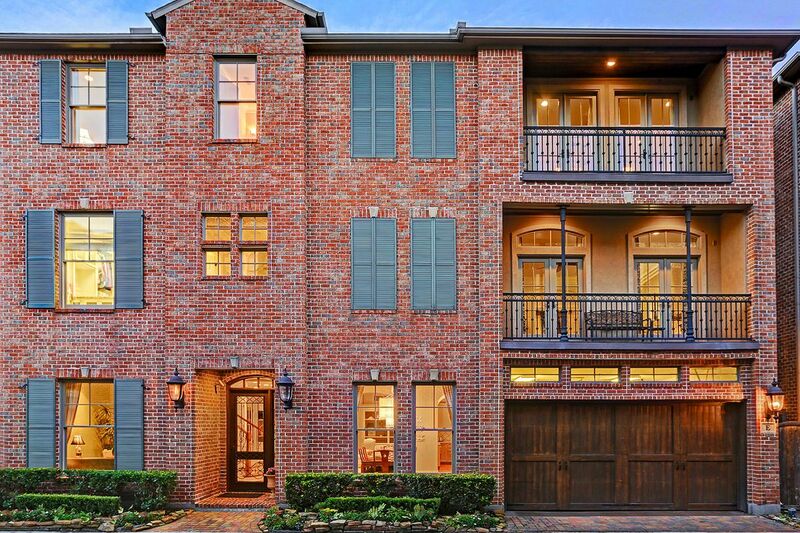 ft.
Gorgeous Tanglewood area home in gated enclave is located around the corner from Houston Country Club and features first-floor living at its finest. 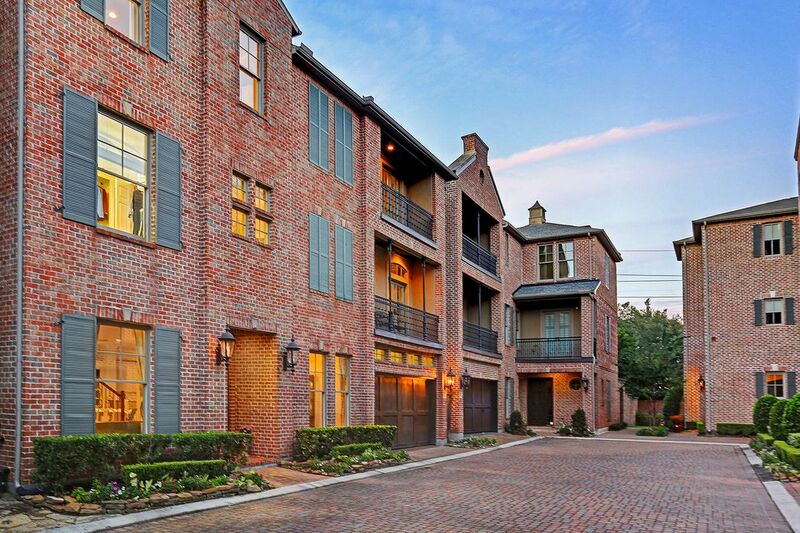 Traditional brick construction with a French flair and a convenient grassy common area for pets. 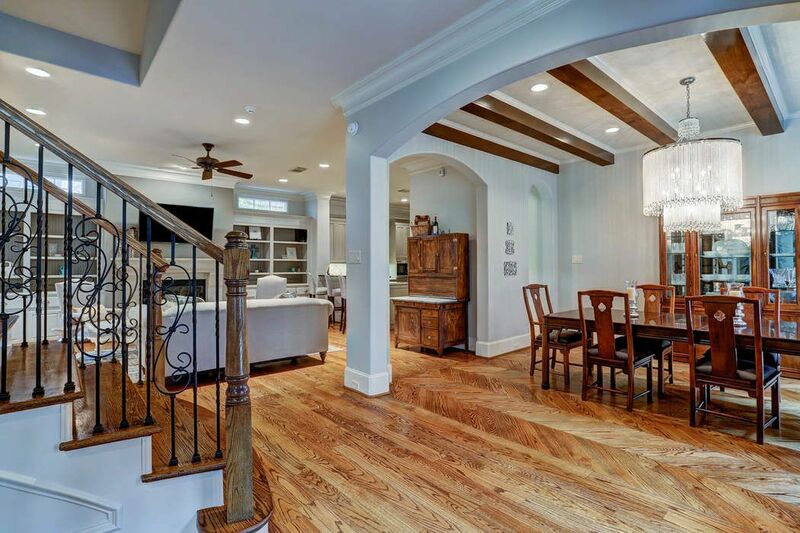 Incredible first-floor dining room features a wood beamed ceiling, posh designer lighting and wood floors flowing seamlessly throughout the entry, living room, study/music room and kitchen. 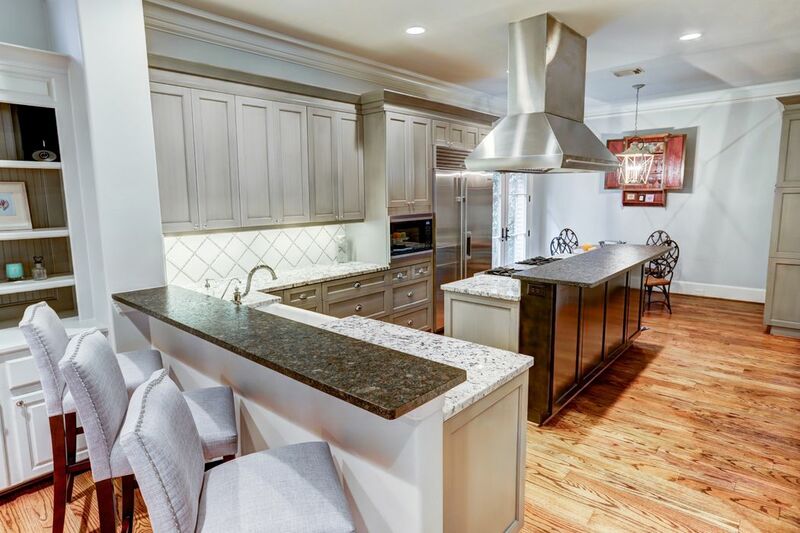 No expense was spared in the kitchen complete with Wolf six-burner gas range, Sub-Zero refrigerator, oversized granite island and custom cabinetry. 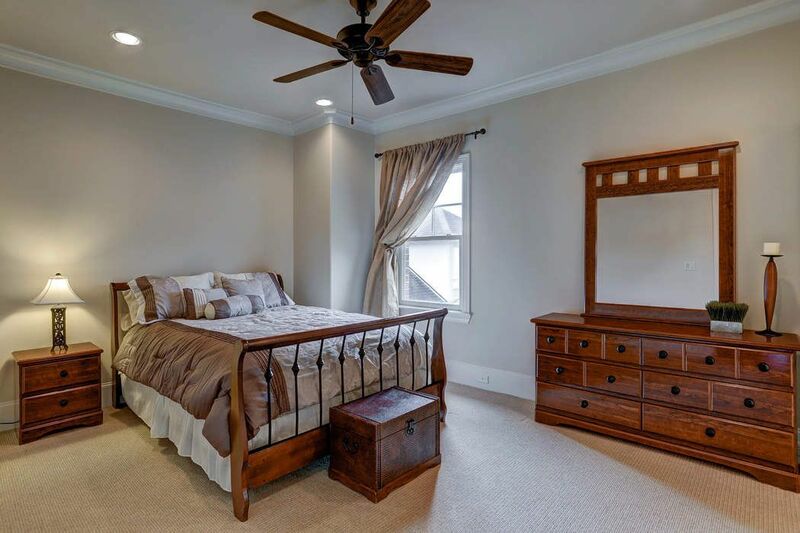 Second story owner’s paradise with oversized master bedroom and balcony, luxurious master bath with granite and stone finishes, huge designer closets, private study with fireplace, family room, laundry and powder bath. 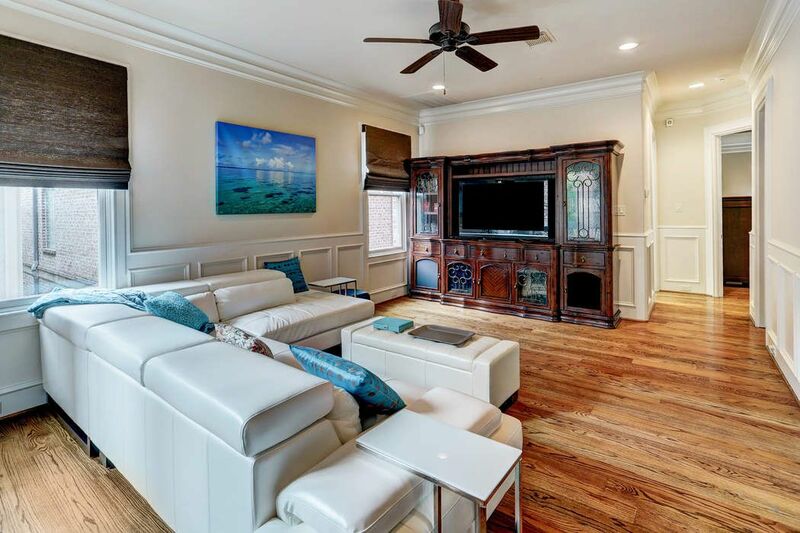 The third floor boasts wood paneled media room, game room with two built-in wine and beverage fridges and three additional bedrooms each with full baths plus a powder bath. The elevator services all floors. Never flooded.